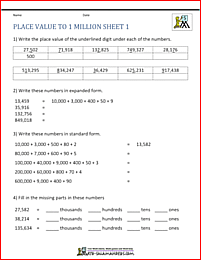 Welcome to the Math Salamanders 5th Grade Place Value Worksheets. 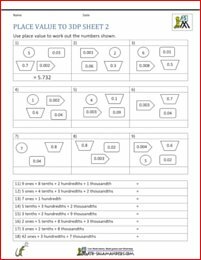 Here you will find a selection of math worksheets to help your child learn to use place value with decimals to 3 decimal places. 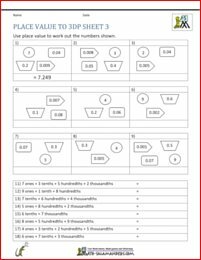 The worksheets on this page will help your child learn to understand and use decimal place value. use tenths, hundredths and thousandths. The sheets have been split into several sections. In each section, the sheets start easier and get progressively more challenging. The first section is all about converting from expanded form to standard form and understanding the value of each digit. The second section is all about converting from standard to expanded form. The last section has some place value riddles to solve - a chance to apply your place value skills to solve word problems. Using riddles is a great way to get children to apply their place value knowledge to solve problems. It is also a good way to get children working collaboratively and talking about the language together. You can also get the children to choose one of the numbers in the riddle and ask each other questions. Our 4th grade place value worksheets involve using place value with decimals to 2dp and also place value with BIG numbers. The sheets are similar to those on this page, but are at a simpler level. 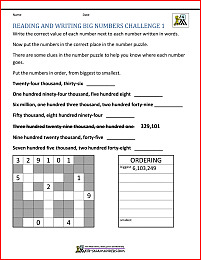 The sheets in this section involve reading, writing, ordering and using place value with numbers to 1 or 10 million. 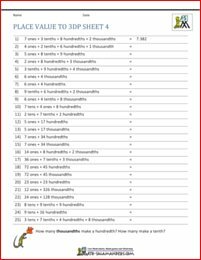 Using these sheets will help you child to understand place value using large numbers. We have a selection of place value charts with decimals which are great for helping to develop understanding of decimal place value. The charts cover a range of decimals from tenths to millionths. They are a good supporting resource for children who are finding decimal place value difficult. Our place value grids are also visual aids to support children's understanding of place value. They are a very useful resources to help children convert to and from expanded form.